A couple of years ago, Kenny and I paid a visit to The Exploratorium in San Francisco. Ever been there? It’s pretty amazing. It’s a gigantic interactive science museum packed with over 600 experiments about everything from sound and light to plants and electricity. One of my favorite exhibits is a game you play with a partner to highlight the differences in the ways we see colors. When Kenny and I looked at the exact same dot, he saw green and I saw orange. HOW DOES THIS HAPPEN?! Did you see it? It’s about learning by experimenting. It’s the idea that we learn best by doing, by creating, by asking questions, and even by playing. Learning theories and memorizing principles can only take us so far. Sometimes the best way to spark innovation and creativity is simply to try something — to get our hands a little dirty. So whether it’s a new take on an old event, a restructuring of our programming, or a new approach to how we do something, we learn best when we finally do something. When we try new things. When we EXPERIMENT. But why does it matter? Why is experimenting with new ideas valuable? Kids change, and so does the world they live in. The things they care about, the struggles they face, and the things that make them laugh are constantly evolving. So if we want to keep up with them, we’ve got to keep innovating and trying new things. We’ve got to keep experimenting. We’ve got to keep learning, over and over again, what connects with them and the world they live in. Because what worked yesterday may not work today. And what works today may not work tomorrow. Keep experimenting, because kids change. Kids aren’t the only people who are changing. You and your team are changing, too! Whether it’s staff or volunteers, you have a constantly changing group of people doing ministry alongside of you. You’ll see changes in your roster as you lose and gain team members, but you’ll also see changes in the individuals on that roster as they each grow, learn, and develop new skills and passions. You know why that’s awesome? Because you have an ever-changing set of skills, insights, and ideas at your disposal! Someone is learning graphic design? Give them something to create! Someone is passionate about a charity they’ve discovered? Let them champion a new initiative! Someone is doing their masters in counseling? Ask them to teach your team something! So as your team changes, pay attention. Then tap into those changes for the benefit of your ministry. Keep experimenting, because your team changes. There is always a list of things in our ministries that we can improve. But we don’t always address these shortcomings. Maybe because we honestly don’t see them. Or maybe because, let’s face it, it’s pretty easy to do things the way we’ve always done them. But if we want to continue innovating (and we should, because I’m pretty sure that’s the key to staying effective over time), then we can’t be okay with mediocre ministry, mediocre systems, or mediocre strategies. I know it’s scary to try new things sometimes. I know it can be complicated. But the truth is, our ministries all have about a million areas where improvement can be made. And unless we start experimenting and trying new things, those problem areas will never be fixed. Keep experimenting, because things are never perfect. Experimenting makes us brave. Taking risks is scary, but failure is part of the process. When we force ourselves to go out on a limb again and again, we’ll become a little less afraid of failing. Experimenting keeps us humble. When we try new things, we quickly discover how little we know and how much we have left to improve. Experimenting teaches us to rely on others. If you’re trying to conduct all of your youth ministry experiments in isolation, you’ll quickly discover that you’re running out of steam. That’s because creativity works best in a crowd. When we invite other voices into our ministries to help us brainstorm and execute new ideas, we begin to see just how little we can do alone. Keep experimenting, because it makes you better. Let’s be real here, guys. Those first four things are pretty great side effects of experimenting with new ideas in our ministries. But this one is my favorite. 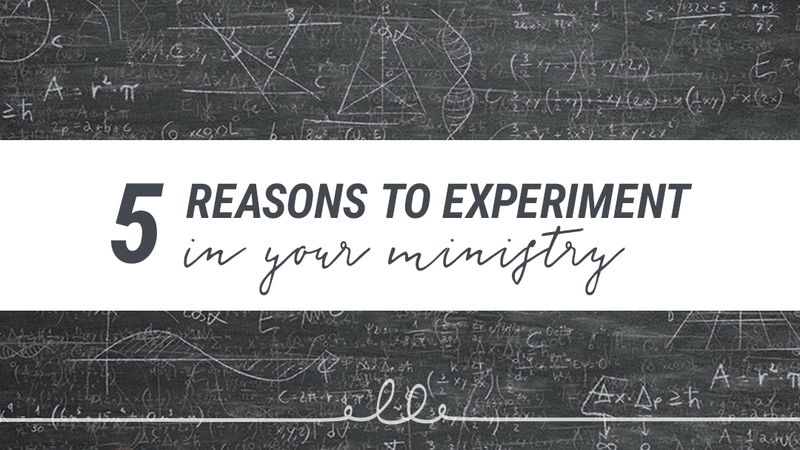 In our ministries, we experiment because… well, because it’s fun. It’s fun to create. It’s fun to come up with new ideas and see if they work. It’s fun to make something out of nothing. It’s almost as if we were made this way – made to create, just like the Creator in whose image we were created. So if none of those other points inspired you to run a few new experiments in your ministry, maybe this one will. Go ahead. Try something new in your ministry simply because it’s fun. Invent something. Breathe new life into something that’s gone stale. Switch things up. Do something you’ve never done before. Keep experimenting, because it’s fun.